I decided to walk to the Aquarium after work on the coldest day in Vancouver going back several years. Not as insane as one might think when my understanding was there would be more than 1 steaming pot of seafood chowder waiting for me when I arrived. There were in fact 12 steaming pots. As Ocean Wise sustainable seafood program founders, The Vancouver Aquarium has declared November as Ocean Wise Month which culminates in the Chowder Chowdown. 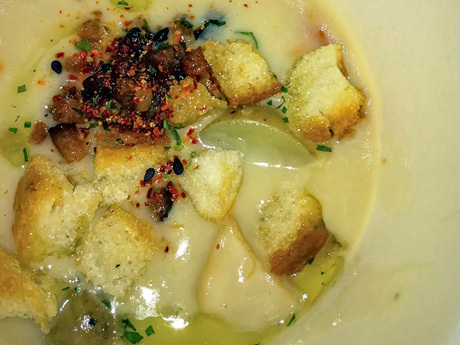 Mike McDermid had coerced and assembled top restaurants in BC to present their best Seafood Chowders. Not to mention a judges panel consisting of local big fish chefs such as David Hawksworth and Robert Clark. Also judging were local blogstar “Miss604” Rebecca Bollwitt, Albion Fisheries’ Chester Carey, and Vancouver Deputy Mayor Kerry Jang. Wild Rice, Aqua Riva, COAST Restaurant, Codfather’s Seafood Market (Kelowna), Hapa Izakaya, O’Doul’s Restaurant & Bar, Pacific Institute of Culinary Arts (PICA), Redfish Bluefish (Victoria), The Ramada Plaza (Abbostford), Rocky Mountain Flatbread, Savoury Chef, and Vancouver Aquarium itself. About 400 of us wandered around the spectacular tanks with bowl after bowl of scrumptious chowder, each paired with a local cottage brew. I assure you the irony of this was not lost on me. Watching Nemo’s family swimming in a frantic search as I slurped up another spoonful of tasty whitefish was more than amusing. We live in a symbiotic relationship with other creatures — a state of respect and renewal. We should not only get used to the fact that fish are indeed food and always will be, but realize this is only true if we use our top-of-the-foodchain brains to override our reptilian brain’s urges to simply pillage, plunder and satisfy our short term desires. This way we can enjoy the visual beauty as well as the taste of our oceans. We all know how simple that sounds on the surface yet when we dive deeper this simple concept is a hard fish to fry. We know not what we do. Most people can’t possibly understand the butterfly effect of putting fish stix in front of their kids or ordering shrimp on their pizza. The Ocean Wise program is here to help us with that. For one thing it works with business to affect change. Jason Symington, Executive Chef, at Panago was challenged to find a supplier for sustainable shrimp until Ocean Wise supplier Albion Fisheries committed to the program. With Albion on board, Panago can now offer Ocean Wise shrimp in all 170 of there locations across the country. I was quite stunned to learn that even with all the grocery store products and fresh seafood shopping, 68% of the worlds seafood is consumed at a restaurant or in the food service industry. Ocean Wise minds have done the thinking for us so we don’t have to spend 8 years of our lives in a University level biodiversity program. We can concentrate our efforts on taking cooking classes and watching the Food Network. Further comforting is the fact that it appears the nation’s chefs are getting on board in a hurry and the tipping point is nigh. Check out the Ocean Wise Cookbook. which was also one of the many prizes won on the evening. winner of both People’s Choice and Judges award was Chef Ben Akira Berwick and team of Hapa Izakaya for their Halibut Dashi Chowder. Maybe they will offer it on their menu in the future? I think a few comments should also be made on behalf of Aqua Riva‘s Manhatten style chowder with Saffron, Chorizo and citrus creme which I thought was “right up there” as well as the concept behind Codfather’s entry. Codfather’s served their chowder with a spoonful of saltine cracker ice cream which was a very interesting experience. There was a lot of bacon floating around on the night as well as coconut, which were both generally used wisely but in a few instances a little overpowering. If you go next year, and you most certainly should, I’d advise taking that walk through the park, before and after. I sloshed out of there like a Beluga. The next morning in the city we had our first snowfall of the year. 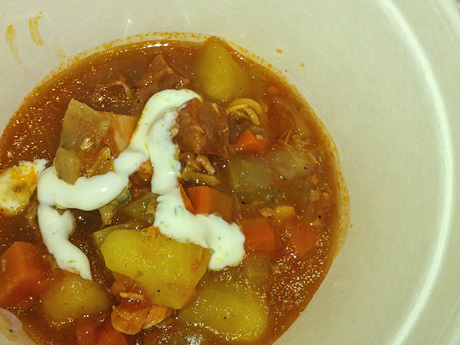 It was again the typical Vancouver soupy chowder on the streets. Only this time I understood when it comes to real chowder, there is a real difference. sounds delicious! wish i could have joined you.